AboutThe Oborn Story Kent Oborn founded Oborn Transfer and Storage in 1969. After purchasing an existing company in Ogden, Utah, he focused on moving and storage for household goods. Over the course of 20 years, Mr. Oborn gradually changed the focus of the company from household goods to freight. Now, Oborn is a full-service general freight storage and cartage transfer, warehouse, and storage facility capable of storing just about anything. Warehouse Storage We currently operate 80,000 square feet of indoor warehouse space. We also have an 5-acre outside storage area where we handle dimensional lumber and other products. Our unique location in the Freeport Center allows us to expand our space almost at any time. Whatever your storage or freight needs are, Oborn has the facilities and capabilities to accommodate your business requirements. 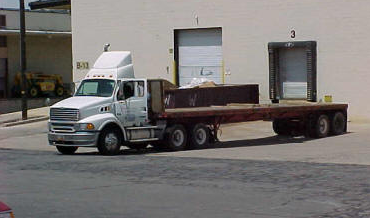 All of our locations have rail and truck access along with the appropriate equipment to handle your freight safely, efficiently, and securely. Local Cartage We have trucks that deliver daily to the following Utah cities: Logan, Brigham, Tremonton, Ogden, Clearfield, Layton, Bountiful, Salt Lake, West Valley, Tooele, Orem, Provo, Spanish Fork and Nephi. We can also accommodate point-to-point deliveries with vans and flatbed trailers. We have trucks that deliver daily to the following Utah cities: Logan, Brigham, Tremonton, Ogden, Clearfield, Layton, Bountiful, Salt Lake, West Valley, Tooele, Orem, Provo, Spanish Fork and Nephi.